How much are you going to charge? This might just be one simple question but can totally ruin client negotiations if you are unprepared of the answer. You might be considering the fact that if you go too high, you might lose the client, and if you go too low, you might have undervalued your services and products. While you are contemplating on these matters, the client is anxiously waiting for your answer, making you panic and frantic. Good thing there is a way to get away with this alarming situation, that is, with the use of rate sheets. 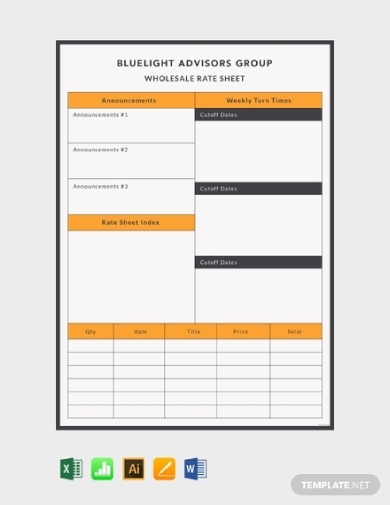 Rate sheet templates can help you organize your rates and charges so you can easily answer client questions as regards your rates. It is common to focus your attention to the details regarding your rates, but you must also not forget to showcase the greatness of the products and services that you are offering. Additionally, you must not let your branding be taken for granted; you have to design a rate sheet that best reflects the personality of your company. 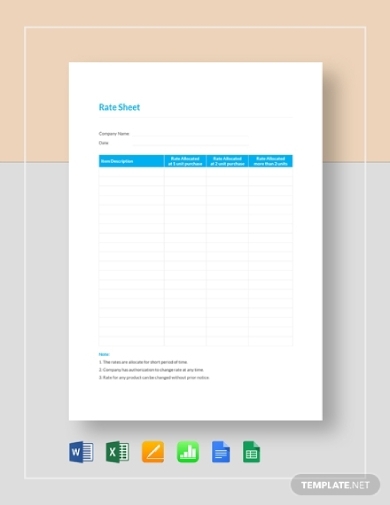 In order to help you create a rate sheet with ease, here is an editable rate sheet template that you can use. Because of its editable feature, you would not have a hard time incorporating your personal or your company’s rates. You can also drag the design elements around until you get satisfied with the output. It is important that you prepare in advance the rates of the products and services that you are offering so when the time comes that a potential customer asks you regarding your rate, you can immediately give an answer. You can do this by listing down your rates in a document called rate sheet. 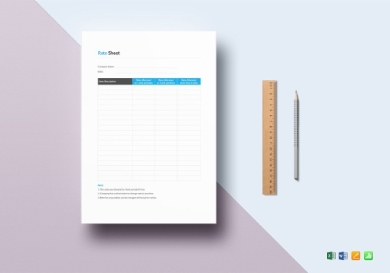 To help you achieve a professionally designed rate sheet, you can use this basic rate sheet template that is created by professional graphic artists, providing you a guarantee of high-quality graphics and designs and making your rate sheet presentable and elegant. 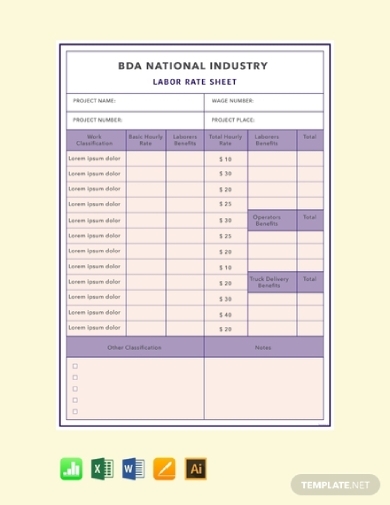 If you are a business offering services to your customers, it is best to have this labor rate sheet where you can make a list of the services that you are offering and their corresponding labor rates. In this way, you become organized and consistent with your rates. Through this rate sheet, you can easily attain your desired design because it can easily be edited in different software applications that can open Illustrator, Numbers, MS Excel, Pages, and MS Word file formats. You can also easily download and print the file, making it very convenient for every user. 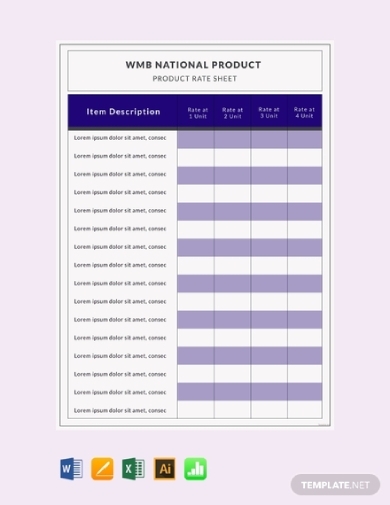 This product rate sheet template allows you to document the rates of your product with ease and convenience. You can replace the header with your company information, such as the name of your company and company logo, address, and contact details. In the item description column, you can list down the products that your company is offering and a brief description of the product. Finally, write the corresponding rates for different quantities or units that the customer might purchase. For individuals or companies offering various services, a rate sheet is a must. It does not only present the rates of the services available but also lists down the complete list of all the services that the customer can avail of. In this way, all the items in the list are promoted and the customer will get to know other available options. 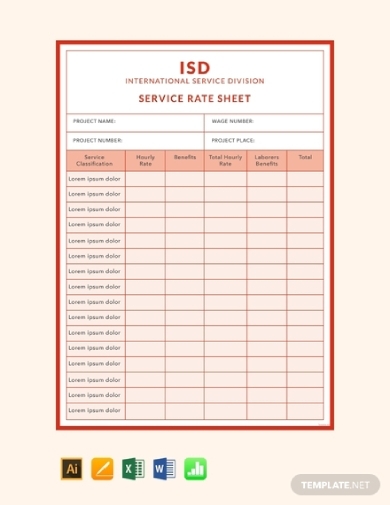 So create your service rate sheet now with the use of this template that is highly customizable according to your style and specific preferences. In a wholesale business, the wholesaler distributes the goods or merchandise to retailers may it be for commercial or institutional purposes. It pertains to the sale of goods to anyone other than a standard customer. Usually, the goods sold are in bulk or large quantities. Because a wholesaler supplies a huge market, it must be consistent with the pricing of its merchandise. Hence, a rate sheet is needed. 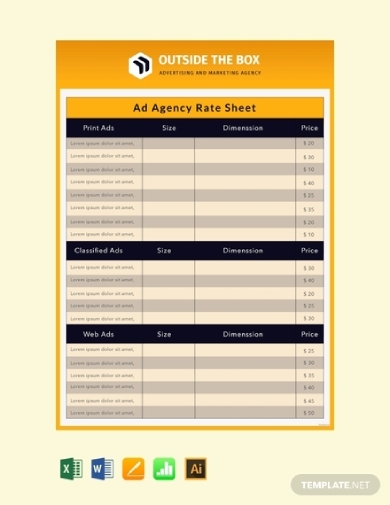 Here is a template of wholesale rate sheet that you may use and customize. 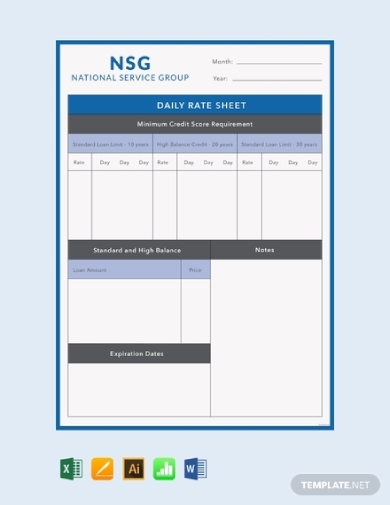 In this daily rate sheet, featured are the details to a loan agreement, such as the minimum credit score requirement, standard and high balance, expiration dates, and notes. The computed daily rates regarding standard loan limit for 10 and 30 years and high balance credit for 20 years can also be presented. This is a way for debtors to monitor the amount they loan, the payments, as well as the outstanding balance. If you are an advertising agency, you must not just be concerned with featuring your rates on a rate sheet but also be mindful in designing the sheet as this is a way to launch your branding on the market. Apart from business flyers and posters, you can also use the rate sheet to advertise your services and products. Moreover, by incorporating your logo and other branding elements, more people will get to know not only your offers but also your company as a whole. 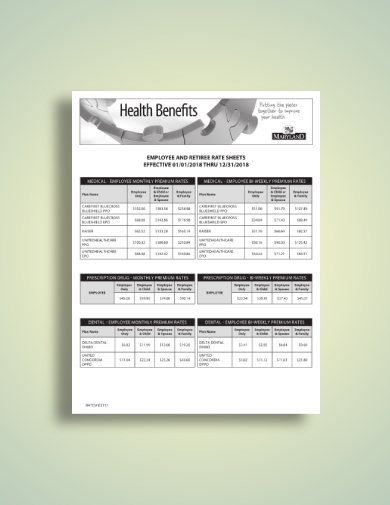 Included in this employee and retiree rate sheet are the monthly and biweekly standard and premium rates for certain health benefits, such as medical plan, prescription drug, dental, term life insurance, and accidental death and dismemberment insurance. The information contained in this document is very important especially for the members so they would know the benefits that they can receive from a certain health care plan. 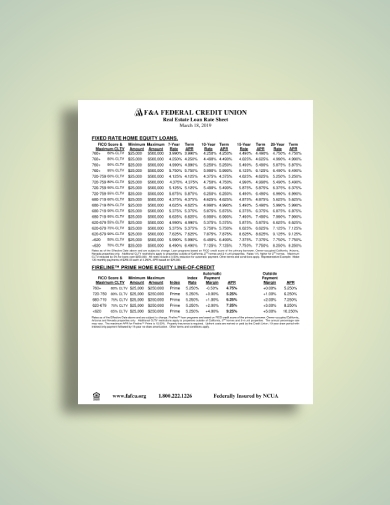 In this real estate loan rate sheet, presented are the different rates in a real estate loan such as the following: fixed-rate home equity loans, home equity loans, fixed-rate first mortgage loans, fixed-rate high-balance mortgage loans, down payment minimizer home loan, and payment match mortgage loan. The details of the loan as well as the terms and conditions of the payment and related agreements are also presented in this document.